We were recently sent a Tomy Baby Monitor to review. 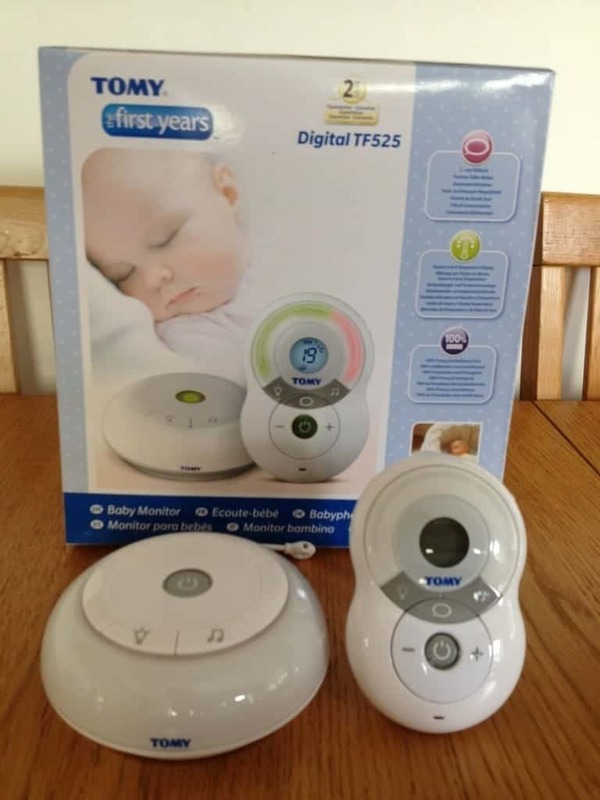 It is one of the range of 5 Next Generation Tomy Digital Monitors that have been released – 3 standard audio baby monitors, a video baby monitor and a movement sensor pad monitor. Tomy is a big name in the baby and toddler world and their range of baby monitors have won every major parenting award over the last three years – Tomy is a brand parents trust and we were keen to put one of Tomy’s newest additions to the test. What is the Tomy Digital Baby Monitor TF525 like? The digital monitor we were sent – the TF525 – is the middle of the range of the three new baby monitors. It has all the features of the entry level model which are present in the whole range of baby monitors – DECT (Digital Enhanced Cordless Technology) for crystal clear, interference-free sound, 350m range, 120 channels and low battery level & out of range alarms, sound level light display, sound activation mode, rechargeable parent unit with belt clip and a pager function in case it’s misplaced. Also included is a remote control night light with adjustable brightness. As well as the above features this Tomy Baby Monitor has a two-way talkback option and is the first TOMY baby monitor to include lullabies – which can be switched on and off remotely from the parent unit – like the nightlight. The parent unit also displays the nursery temperature, low battery level indicator and a back-lit LCD screen. How have we found the Tomy Digital Baby Monitor TF525? We have been using this Tomy Baby Monitor for both children – Little Man during his nap times and LP overnight, so that we could see how the different functions worked in different situations and with different age children. We found that at the times the Tomy Baby Monitor sounded muffled – LP chatting to herself didn’t sound as clear as it has with other baby monitors. Having said that, the sound on the baby monitor was always consistent and had a good range – we could still use the Tomy Baby Monitor at the end of our 140ft garden where other monitors couldn’t reach that far. Does the Tomy Digital Baby Monitor TF525 have other features? The lullaby mode is a great addition for smaller babies and it was great being able to use the remote control function on the parent unit to turn the music on and off – this is also great if the baby wakes up and you want to try and settle them before going into the room and risking disturbing them further. We found that LP wasn’t keen on the walkie talkie parent talk back function – it’s not something we’ve ever used with her and so us talking to her but not being in the room frightened her, she didn’t understand it. However, if you used this function from a young age and the child got used to it then it would definitely be a useful addition to the baby monitor. Were there any negatives with the Tomy Digital Baby Monitor TF525? We did find that the light up buttons on the parent unit were very bright and at night we were very aware of them lit up in our room. The nightlight on the baby unit was also incredibly bright, even on the lowest level, and a very white light. A more natural light would have been better. The sound level light indicators were great – they gave a very accurate indication of the level of noise in the child’s room. It was also great to have the temperature displayed on the parent unit – the weather has been so changeable recently that it’s good to know the temperature to know exactly what to dress babies in overnight. We didn’t test the Tomy baby monitor battery life fully but used the baby monitor how we normally would – we turned it off in the morning and then put it back on for nap time bringing the parent unit downstairs. The parent unit would then keep power until we went to bed in the evening. We would then plug the baby monitor in overnight and it would be fully charged by the morning. The parent unit would last for at least 8 hours without the low battery alarm going off. What was our overall opinion of the Tomy Digital Baby Monitor TF525? Overall we found that this was a reliable baby monitor with everything you could need from a digital monitor. It has a lot of functions that you would expect in this price bracket (£49.99) and I don’t think you could ask for more features in a digital monitor. This should definitely be a contender for anyone looking for a digital baby monitor. Disclosure: We were sent this Tomy baby monitor for the purpose of the review, however all opinions are my own. Next Post Next Step… X-Factor!